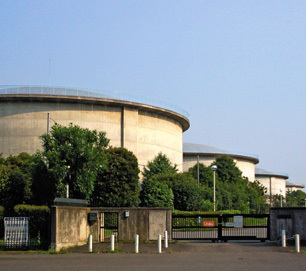 A water purification plant in Tokorozawa, Japan. Chlorophenols may form as a result of water disinfection involving chlorine. 2,4,6-Trichlorophenol (also known as Dowicide 2S) is a chemical that, prior to the 1980s, was used as an antiseptic, pesticide and non-food preservative. It's the most commonly studied of the chlorophenols, a group of chemicals that can form as by-products of water disinfection involving chlorine or bleach, or as a breakdown of some herbicides. Other common chlorophenols found as chlorination by-products are 2-chlorophenol and 2,4-dichlorophenol, though there is limited knowledge of these compounds. Chlorophenols are easily dectected, and can be tasted or smelled (according to the EPA, 2,4,6-trichlorophenol has a “strong, sweet smell”) at levels far below their harmful effects. 2,4,6-trichlorophenol has been shown to cause respiratory problems in workers exposed occupationally, and animal studies have shown long term effects on the liver and blood. It's classified by the EPA as a “probable human carcinogen,” and a known animal carcinogen, causing lymphomas and leukemias in animal studies. According to the World Health Organization, 2,4,6-trichlorophenol may be treated with with granular activated carbon (GAC).